Glenn Kaino: 19.83 is the New York debut exhibition that marks the genesis of Kaino’s ongoing collaboration with Olympian Tommie Smith. On October 16, 1968, during the medal ceremony for the men’s 200-meter race at the Mexico City Olympic Games, American athletes Tommie Smith and John Carlos raised black-gloved fists as a symbolic act of protest. The gesture, seen around the world and preserved in images that still resonate today, became a catalytic symbol for myriad beliefs, ideas and social causes. The exhibition consists of two works: Bridge (2013), in the Museum’s atrium, and 19.83, in the Museum’s project space. Bridge, a site-specific intervention composed of gold-painted casts of Smith’s arm, is a reservoir of memories that reflects on the power of the athletes’ gesture nearly four decades after its occurrence. 19.83, the title of both the work here and the exhibition as a whole, refers to Smith’s world record–breaking time in the 200-meter race, 19.83 seconds. The work is a gold-plated sculptural environment that takes the form of a three-level platform reminiscent of the one used to honor Olympic medalists. Together, these works examine the conditions in which symbolic moments enter history, how these circumstances evolve over time, and how memory and history compete for relevance in the present. 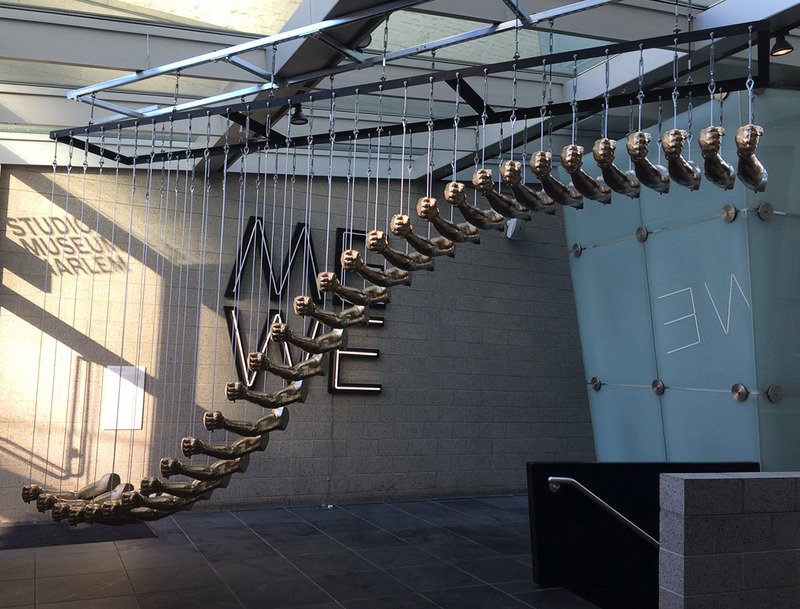 This entry was posted in Exhibitions and tagged 19.83, 2014, Glenn Kaino, Harlem, Kavi Gupta, March, Naima J. Keith, NYC, Studio Museum on March 24, 2014 by achang. The 2015 Call for Participation for the 103rd Annual Conference, taking place February 11–14, 2015, in New York, describes many of next year’s programs sessions. CAA and the session chairs invite your participation: please follow the instructions in the booklet to submit a proposal for a paper or presentation. This publication also includes a call forPoster Session proposals and describes the seven Open Forms sessions. Deadline: May 9, 2014. This entry was posted in Announcement, Call for submissions, Conference, Talk/Panel and tagged 2015, caa, Call for Papers, CFP, College Art Assocation, NYC on March 14, 2014 by achang. Asian Diasporic Visual Cultures and the Americas (ADVA) will be published by Brill in affiliation with the Asian/Pacific/American Institute, New York University (New York) and the Gail and Stephen A. Jarislowsky Institute for Studies in Canadian Art, Concordia University (Montreal). Asian Diasporic Visual Cultures and the Americas is a new peer-reviewed journal that features multidisciplinary scholarship on intersections between visual culture studies and the study of Asian diasporas across the Americas. Perspectives on and from North, Central and South America, as well as the Pacific Islands and the Caribbean are presented to encourage the hemispheric transnational study of multiple Americas with diverse indigenous and diasporic populations. The broad conceptualization of the Americas as a complex system of continual movement, migratory flows and cultural exchange, and Asian diaspora as an analytical tool, enables the critical examination of the historically under-represented intersections between and within, Asian Canadian Studies, Asian American Studies, Asian Latin American Studies, Asian Caribbean Studies, and Pacific Island Studies. The journal explores visual culture in all its multifaceted forms, including, but not limited to, visual arts, craft, cinema, film, performing arts, public art, architecture, design, fashion, media, sound, food, networked practices, and popular culture. It recognizes the ways in which diverse systems of visualities, inclusive of sensorial, embodied experience, have shaped and embedded meanings within culturally specific, socio-political and ideological contexts. Asian Diasporic Visual Cultures and the Americas is dedicated to the critical examination of visual cultural production by and about Asian diasporic communities in the Americas and largely conceived within a globally connected framework. The journal provides an intellectual forum for researchers and educators to showcase, engage and be in dialogue with this growing multidisciplinary area of investigation within the humanities and will be published twice annually with one double issue. Along with academic articles, each issue features reviews of a wide range of visual cultural production, including books, films, and exhibitions, as well as full colour artist pages. The journal welcomes transnational and transhistorical as well as site-based scholarly critique and investigation on visual cultures that engage with historical, material, cultural and political contextualizations within current discussions on race, ethnicity, gender, sexuality, dis/ability and class as well as aesthetics, ethics, epistemologies, and technologies of visuality. Transcultural areas of investigation in the humanities, including Asian-Indigenous collaborations, historical formulations of Afro-Asian connections, and studies on transnational subjects of mixed race heritage, are welcome. In this way, the journal recognizes the critical project of challenging not only the assumed pan-ethnicity of cultural groupings but also the varying degrees of racialized experiences that have been freighted by cultural stereotypes or based on regional identifications, geographical proximity and fixed temporalities. First issue is planned for publication in Winter/Spring 2015. Essays (between 5,000-6,500 words) and reviews (between 800-1,000 words) should be prepared according to MLA (for humanities) or APA (for social sciences) style and submitted electronically. Proposed artist pages (up to 6 pages) will also be considered. More detailed instructions for authors can be found at brill.com. Authors’ names should not appear on manuscripts; instead, please include a separate document with the author’s name and address and the title of the article with your electronic submission. Authors should not refer to themselves in the first person in the submitted text or notes if such references would identify them; any necessary references to the author’s previous work, for example, should be in the third person. Please send queries or submissions to: ADVAedit@gmail.com. This entry was posted in Announcement, Call for submissions and tagged A/P/A Institute, ADVA, Asian Diasporic Visual Cultures and the Americas, Brill, CALL, Concordia University, Gail and Stephen A. Jarislowsky Institute for Studies in Canadian Art, journal, Leiden, New York University, NYU on March 11, 2014 by achang. Asian American Art, A History: 1859-1970 on sale at Stanford University Press for $10 for hardcover! Edited by Gordon Chang, Mark Johnson and Paul Karlstrom is on sale at this site for $10 for the hardcover! (and $5 shipping). The list price for the hardcover is $80…so get it before it’s gone! Spring has arrived (for some of us)! In celebration (or commiseration), we’re offering a gift to you, our faithful readers — over 600 titles at deep discounts: $10 hardcovers and $5 paperbacks. Peruse at your leisure here. The sale lasts through the end of March. And while you’re at it, take a look at some of our forthcoming 2014 titles. This entry was posted in Announcement and tagged A History: 1850-1970, Asian American art, Gordon Chang, Mark Johnson, Paul Karlstrom, Sale, Stanford University Press on March 6, 2014 by achang. The Asian Women Giving Circle — Request for Proposals for its Women, Arts & Activism Fund — deadline MARCH 7! The Asian Women Giving Circle, a donor advised fund of the Ms. Foundation for Women, is pleased to announce a Request for Proposals for its Women, Arts & Activism Fund. The deadline for submitting a proposal is this Friday, March 7, 2014 at 5pm (Eastern Standard Time). Through this RFP, the Asian Women Giving Circle seeks to support Asian American women-led projects that use the tools of culture, the arts and education to raise awareness and catalyze action around critical issues that impact Asian American communities. For the complete RFP and application materials, please visit: Ms. Foundation for Women’s website. This entry was posted in Call for submissions and tagged Activism, Art, The Asian Women Giving Circle on March 4, 2014 by achang.